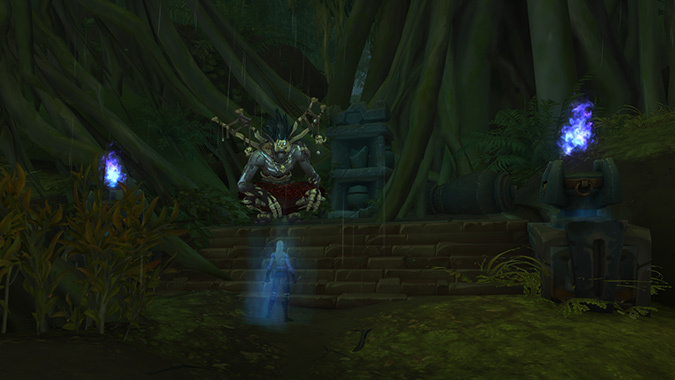 You know, I probably should’ve expected Bwonsamdi would show up if I managed to get in over my head on Zandalar, but the thought hadn’t actually occurred to me until it happened. I mean, I guess I’d be annoyed with his little jabs, but he’s got one of the best voices in the game so I don’t exactly mind listening to his chitchat. Let’s answer some questions, shall we? If I get the turtle people to revered on horde, it’ll count for all of my characters right? Pathfinder is all I need em for. Yes – if all you’re looking for is Pathfinder credit, you just need to reach Revered on a single character. Once you’ve finished the Pathfinder achievement, it’s unlocked for all characters on your account. However, if you want to purchase rep-locked items for your alts, you’ll need to grind out the reputation on those alts — the reputation itself isn’t account-wide, just the achievement. Q4tQ: If the horde playerbase is cast, through the necessarily railroady questing and storytelling of the game as being “team Saurfang” should he continue to actively oppose Sylvanas, (and again, not directly referencing any certainties that might or might not come with spoilers), is it more or perhaps most notably significant that forsaken PCs are put on these rails? It’s been apparent since “old soldier” that “we are all Zappy Boi” in the casting of where the horde playerbase are meant to sit. I can’t say I disagree with that casting because “come play baby burning war criminals, kids” doesn’t seem a wise or viable or intended sales pitch for this particular game but that’s just me. Does the fact that this playerbase quite pointedly includes characters whose angle since launch has been “victory for Sylvanas” tell us a lot more about the future of the story? Like, think about it: Depending on how 8.1 were to play out, regardless of how you think you RP your character, canonically your forsaken PC is potentially no more a Sylvanas loyalist than my characters are Gods from my D&D world! That’s not a small swerve! Well keep in mind this isn’t the first time a racial faction has been split — Garrosh’s actions in Mists of Pandaria resulted in open rebellion, and your characters were most certainly pitted against him regardless of whether or not you were playing an Orc. There’s something a little similar coming into play with the Forsaken, but it’s not entirely out of place. The novel Before the Storm showed us one small group of Forsaken who, while happy to follow Sylvanas, didn’t necessarily agree with all of her sentiments. It’s entirely likely there are more Forsaken out there who feel the same way…although their willingness to speak up and say so within earshot of the Dark Lady has likely been greatly reduced after the events of Before the Storm. Is it railroading? Maybe a little, but it’s for the sake of the story being told. Mists ended up with a pretty great story in the end, I expect Battle for Azeroth will have the same. And keep in mind, if you’re looking at this from the perspective of a Forsaken roleplayer, you don’t have to have your character follow the path they’ve been given via questing and gameplay. I remember more than one Garrosh-loyalist group on my roleplaying server during Mists. Sure, they eventually met with bitter ends, but man was that a fun story for all of them to play out while it was current content. I really feel like I missed some stuff in Drustvar that explains the history of the Drust and the Thornspeakers. I did the main story, and a bunch of the side quests, but I feel like I only scratched the surface of the ancient war with the Drust. And I didn’t see any explanation at all for the Thornspeakers. I just stumbled across them, and happened to help them because they didn’t attack me. Then I got sent to go meet the last surviving Drust, who said hi, and then ignored me. Is there more that I just missed the beginning breadcrumbs of? Make sure you complete the Jaina storyline that takes place after you’ve hit max level and completed all three zone storylines. There’s some information to be found there, including a more extended introduction to the Thornspeakers. In addition, keep an eye out for Drust Stele scattered around Drustvar. It’s for the achievement Drust the Facts, Ma’am — each Stele will give you a little more history into the Drust and what they’re all about. Q4tQ: Considering the Shadow Priest’s penchant for mind stuff (and hearing voices), should Mind Vision allow you to hear random thoughts from that person? No, because it’s “vision” — you’re seeing through another’s eyes, but you aren’t hearing their thoughts. It’s sort of like the Priest version of that old Hunter’s spell Eyes of the Beast (which I still wish they’d bring back) except you don’t even have control of the person you’re seeing through. They’re still controlling the camera, you’re just observing where they go. Mind Control, on the other hand…maybe you could make a case for that. Q4TQ — was there any info on why Taoshi’s voice actress was changed in Legion? Her voice actress didn’t change — she’s been voiced by Grey DeLisle since she was first introduced in Mists. She might sound a little bit different in terms of speech and mannerisms, but you could easily chalk that up, game-wise, to the fact that when we first met Taoshi, we were strangers from distant lands that weren’t necessarily friends or allies. Since then, we’ve earned her trust, so maybe her speech has shifted a bit. Sort of like how anyone in a customer service position has “customer voice” and the voice they use at home. Q4tQ: Given the talk about mysterious forces directing events on Azeroth and the noticeable effect that coming into contact with Azerite seems to have on people, I was wondering… Could Azeroth have already fallen victim to Old God corruption and would Magni even be able to tell if it had? It’s entirely possible, and it’s a theory that Rossi and I have kicked around before. Magni was called to speak to Azeroth, and he’s always been under the assumption that the world soul is who he’s been speaking to. But if the world soul has already been corrupted, that means that Magni’s essentially just having an extended chat with an agent of the Old Gods. Initially I thought it was an interesting theory, but after Magni’s comic…well I’m not really sure anymore. She seems to be leading us down a definitive path where we fix her. But are we fixing her so that she’s all good and purified again, or are we fixing her on behalf of the Old Gods, so that once she’s all put back together, terrible things will happen? That’s a question we don’t have an answer to just yet — we’re going to have to wait and see to find out.